Louise Nugent, archaeologist and specialist on Medieval pilgrimages, wrote this interesting article about the history behind Reek Sunday and Croagh Patrick, in County Mayo. Since we are heading there for our monthly Camino de Santiago prep walk, we thought you’d might be interested to find out more about the history behind it. Reek Sunday is the main pilgrimage day to Croagh Patrick. Croagh Patrick is located on the western coast of Mayo on the southern shores of Clew Bay. 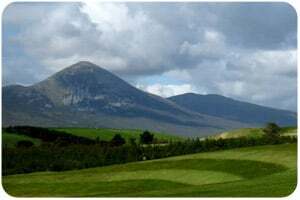 Its pyramid-shaped summit is known locally as the “The Reek”, and the mountain has a long association with St Patrick. Pilgrimage can be undertaken at any time during the year but the main pilgrim days are the last Friday of July, last Sunday of July or Reek Sunday and the 15thof August. In the coming months I hope to expand on this post and explore the prehistoric, medieval, early modern and modern pilgrimages in much more detail. What follows is really just an overview of the history of the pilgrimage here. Join our Camino prep walk on Reek Sunday 28th July 2013!